The springs are what allows your garage door to move smoothly without you or your automatic opener having to overstrain yourselves. People often think it's the motor unit that's supporting most of the door's weight, but these components are the actual parts in charge of that. Because of this, however, they are under a lot of tension and stress on a regular basis, which means they'll end up breaking after a while. When that happens, and even before that, our team can help. 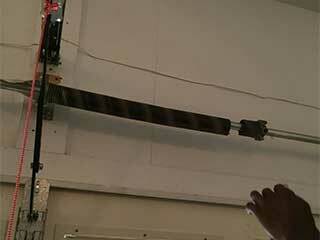 Most modern residential garage doors have one torsion spring. Some are equipped with two, but this is a less common setting. This type of component is preferred for its durability and flexibility, but it requires a certain minimum of headroom space to be available. The unit is mounted over a metal shaft which is positioned right above the door. There is a drum at each end of the shaft, which rotates with it and collects or unwinds the lift cables. During the installation process, the spring is wound tightly until it's become loaded with enough tension to counterbalance the weight of the door. It unwinds as the door opens, releasing the tension and conveying it to the drums and subsequently to the lift cables, which help the panels rise. When the door closes, the spring winds with tension once again, and thus the cycle repeats each time. Units of this type always come in a pair and are mostly used with overhead garage doors. They are installed above the horizontal tracks, stretching towards the inside of your garage, parallel to them, one on each side of the door. They're held in place with a bolt on one end, and on the other, they're each connected to a pulley. When the door is closed, the extension springs are stretched, and the energy they hold in this position works to counterbalance the weight of the door. During the opening process, the units contract and release their stored energy, which is passed to lift cables via the pulleys. All extension springs have safety cables running through them. These are set during installation. Their job is to keep the units in place when they break. Otherwise, they can whip around and hurt someone. If you find yourself of emergency spring replacement, don't hesitate to contact our team. We'll quickly send our experts over to handle the problem safely. As part of the maintenance service we offer, we also perform lubrication maintenance and tension adjustments, which can help your springs last longer and keep your door balanced. Whichever service you need, call our team at Garage Door Repair Danville today to get the effective results you deserve.